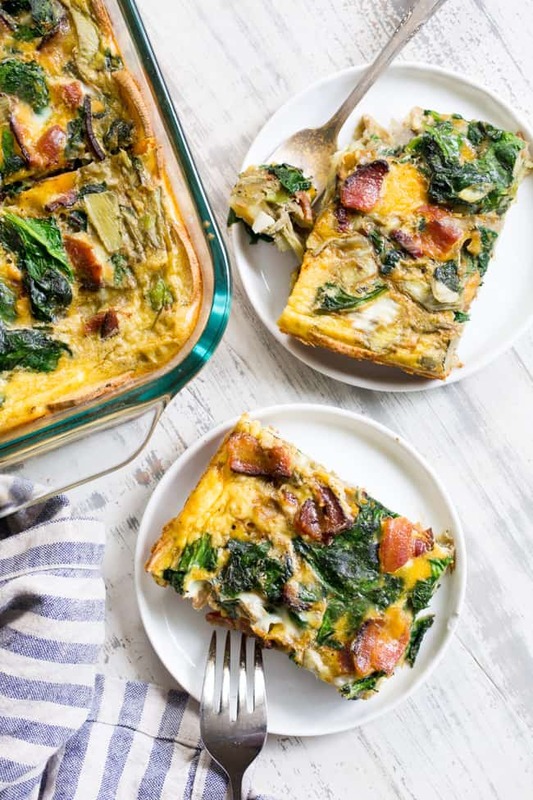 This spinach artichoke breakfast casserole starts with an easy roasted sweet potato crust and is loaded with veggies, bacon, and flavor! Dairy-free, grain free, gluten free, paleo and Whole30 compliant. It’s perfect to make ahead of time for easy, satisfying breakfast all week. 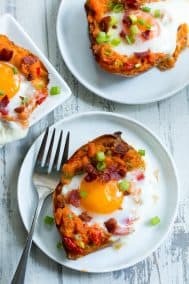 In truth, I’m usually pretty stubborn and make my favorite sweet potato hash with kale and bacon most mornings. Can’t stop, won’t stop, and it’s been that way for years! 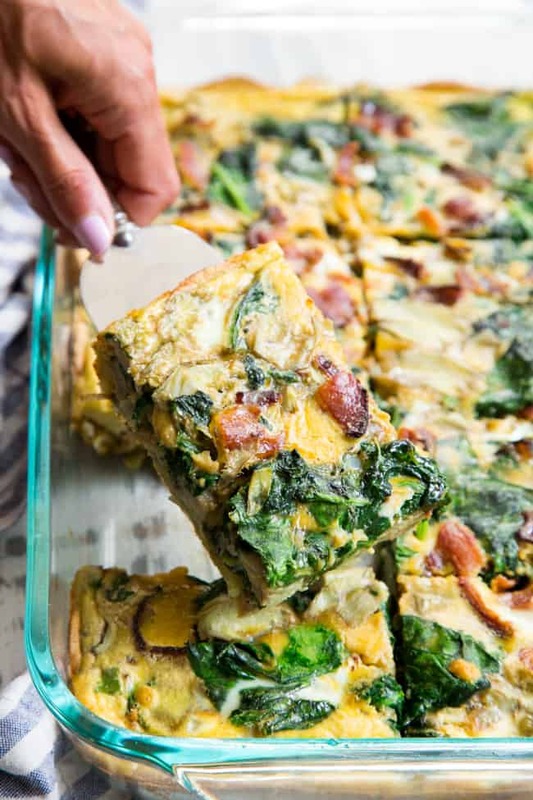 But I do love have breakfast casserole around for quick lunches and even afternoon snacks. Yes, this is what us paleo lovers snack on! However, my kids are another story – they need something extremely quick before school, which usually means plain scrambled eggs with GF toast or cereal. 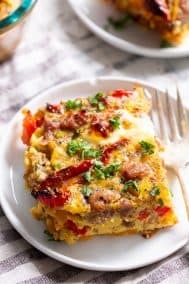 But, when I actually prep and make a Sunday breakfast casserole, they can actually heat it themselves which makes life SO much easier for all of us. Plus, it’s a whole lot tastier and packs a bigger nutritional punch than that toast/cereal! 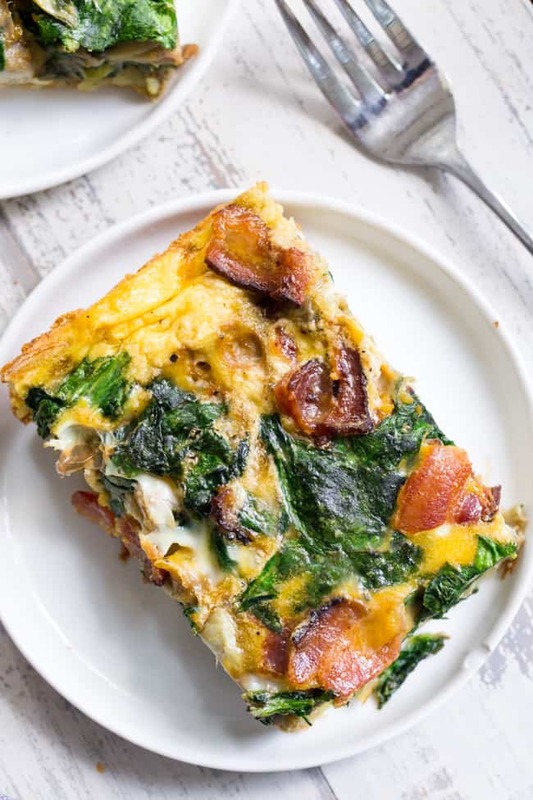 Trust me – I know it’s a decent amount of work to prep and cook a breakfast casserole (though not difficult in the least), but it’s always (yes ALWAYS) worth it in the end! This one is Whole30 compliant, super filling, and combines good carbs, fat, and protein. Plus, if you happen to be a die-hard spinach artichoke fan like I am, you’ll want to eat it for every meal. Which I definitely did for at least 2 days after making it! Here’s the run down on how you put it all together. The sweet potatoes form the bottom layer (or crust) of the casserole. They’ll get roasted in the bottom of the dish while you make the filling. 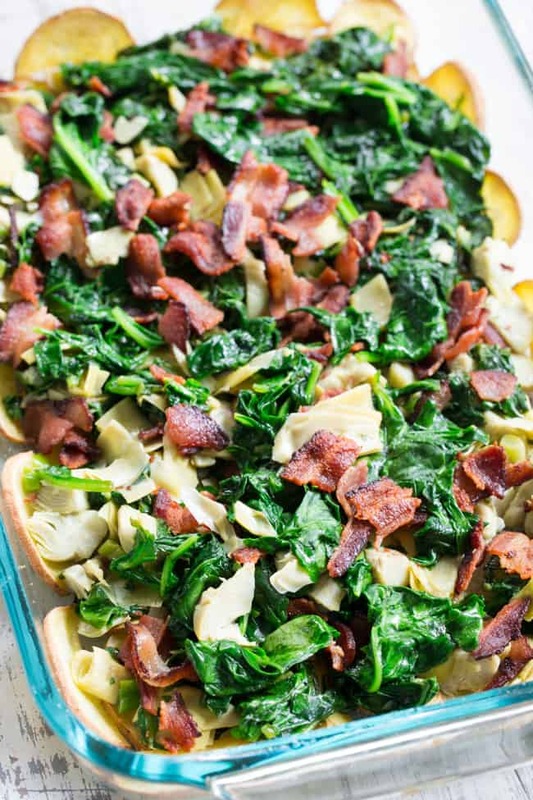 The meat/veggie filling for this recipes is actually really simple – bacon, onions and garlic, spinach, artichoke. It only takes minutes to make on the stovetop since we’re working with quick-cooking ingredients! Then, we whisk together a creamy, flavor-packed egg mixture made with whole eggs, coconut milk (you don’t taste it), seasonings, and nutritional yeast for added “cheesy” flavor. Once the sweet potatoes are roasted, we’ll layer the bacon/veggies and then pour the egg mixture over the top. It bakes up relatively quickly and then you’re good to go! 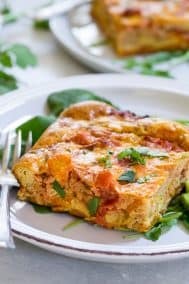 The recipe makes a good 10 servings so it’s perfect to make ahead of time for weekday breakfasts – and hey, you can even double it (in 2 casserole dishes) if you have a huge family and need a ton. 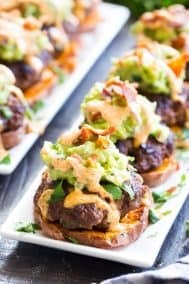 It’s also great to serve for a brunch or really any gathering at all – this is one of those things that both paleo and non-paleo eaters will love, regardless! I hope you’re in the mood for GREENS and a recipe you’ll want to make again and again! Now let’s get to the fun part – grab your aprons (BACON!) 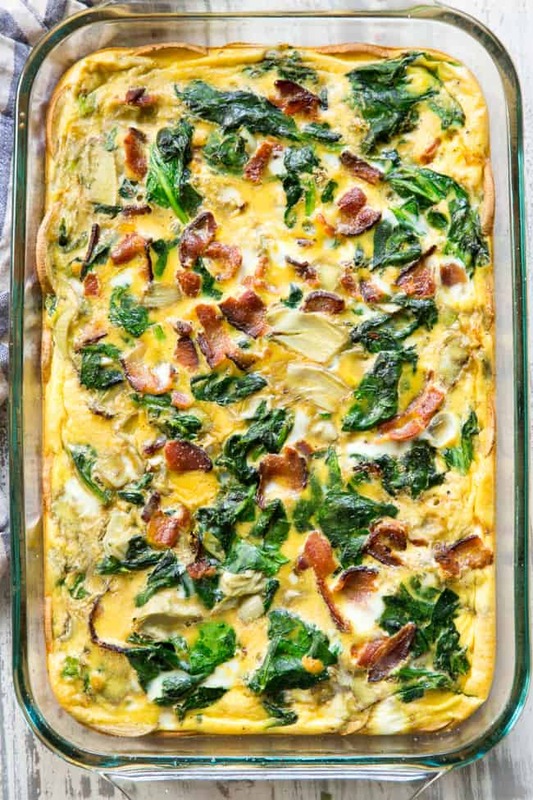 and let’s make this incredible paleo spinach artichoke breakfast casserole! 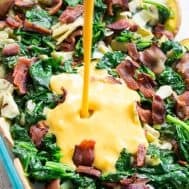 This spinach artichoke breakfast casserole has an easy sweet potato crust and is loaded with veggies, bacon, and flavor! It's dairy-free, grain free, gluten free, paleo and Whole30 compliant. It's perfect to make ahead of time for easy, satisfying breakfast all week. 2 medium sweet potatoes I used white sweet potatoes peeled and sliced into thin rounds approximately 1/4"
Preheat your oven to 400 F and grease a 9x13" casserole dish with coconut oil. 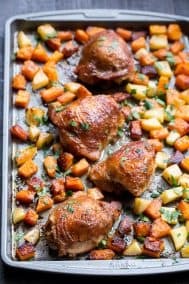 Toss the sweet potato rounds with your cooking fat of choice and sea salt to taste (generous pinch for me) and arrange, (overlapping since they will shrink after roasting) over the bottom of your casserole dish, and along the sides if desired. Place the casserole dish with the sweet potatoes in the preheated oven and roast until softened and beginning to turn light brown, 25-30 mins. Meanwhile, heat a large skillet over med-hi heat and add the bacon slices and cook until crisp, frying in batches if necessary. Drain on paper towels. Discard (or save for another use) all but 1 Tbsp of the rendered bacon fat. Turn the heat to medium and add the onions, cook until translucent, then add the garlic and cook another 30 seconds. Add all the spinach and sprinkle with sea salt, allow it to wilt, then add the chopped artichoke hearts and cook, stirring, to heat through, then remove from heat. In a large bowl or measuring cup, whisk together the eggs, coconut milk, salt, pepper, onion powder and nutritional yeast (if using), until very smooth. 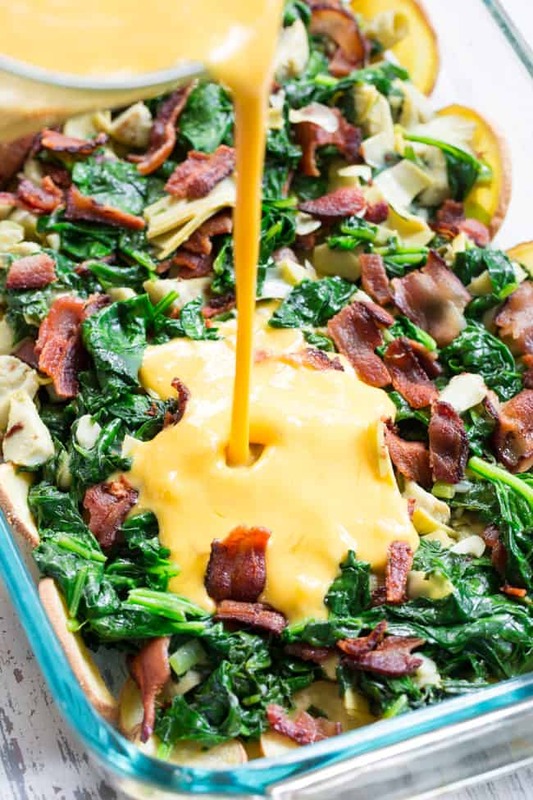 To assemble casserole, arrange the spinach artichoke mixture over the cooked sweet potato crust, leaving excess water in the skillet. Crumble the bacon over the veggies, then pour the egg mixture over the top evenly. 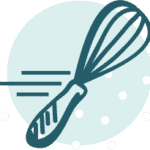 Bake in the preheated oven for 22-25 minutes or until egg mixture is set in the center and begins to puff up. Don’t allow it to overcook or begin to brown! 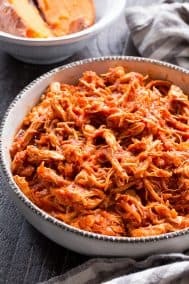 Allow casserole to sit for 10 minutes before slicing and serving. You can also refrigerate or freeze to reheat at a later point. Enjoy! 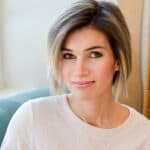 Want More Whole30 Breakfast Recipes? Try One of These! This is a delicious recipe. Thanks for sharing! I love the Paleo Breakfast casserole but colleagues complain about the smell from the Brussels sprouts when I heat it up at work. Can’t wait to try this variation next week! THIS was soooo good! I can’t stop eating it 🙂 Thank you for all the great recipes! Are the sweet potatoes optional or will the casserole not hold together otherwise? 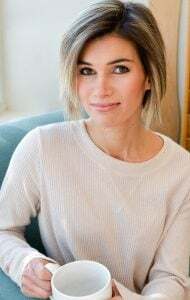 PS- New at reading/cooking your recipes and I LOVE them!!! Excellent breakfast for a crowd!!! Directions are very clear and easy to follow. Will be making this for years to come!!! This is EXCELLENT! Didn’t have high expectations for some reason but it’s so good! The sweet potato “crust” adds the right texture and sweetness – it tastes like a real crust. Anyway…soooo good. THANK YOU!!! This was excellent. Plan on making it for New Years morning. I left out bacon and it was excellent! Thank you for sharing this recipe! Is there a substitute if youbdon’t Eat bacon? 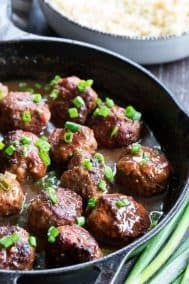 Could I do chicken sausage? Hi there! I was hoping to use this recipe for an upcoming brunch with quite a few people, so I was planning to double the ingredients and make two at once. 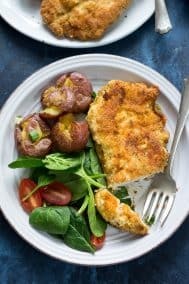 Do you have any recommendation as far as prepping the night before and then throwing it in the oven to cook in the morning before guests arrive so that it tastes as fresh as possible? Would it get too soggy with the egg mixture sitting uncooked in the fridge overnight? Any thoughts/suggestions would be appreciated!! Delicious!! This is one of the best breakfast bakes I’ve had. WIll definitely make again. Next time I’ll keep a better watch and not overcook it like I did this time, but even though it was a little over cooked the flavors were so tasty!! Recipe turned out fantastic. I made this for Easter brunch and it was a hit. The sweet potatoes give the dish great flavor profile, which is rounded out nicely by a dash of a good hot sauce when serving. Did substitute Parmesan for the yeast stuff. First slice revealed quite a bit of excess liquid in the dish, but a careful tip over the sink easily solved that issue. Will definitely make this again and again. Thanks for the great recipe.